English football has come together to raise cancer-awareness. Players from the men's game, past and present, and women's football have teamed up with leading health charities including the MHF for Bowel Cancer Awareness Month in April. 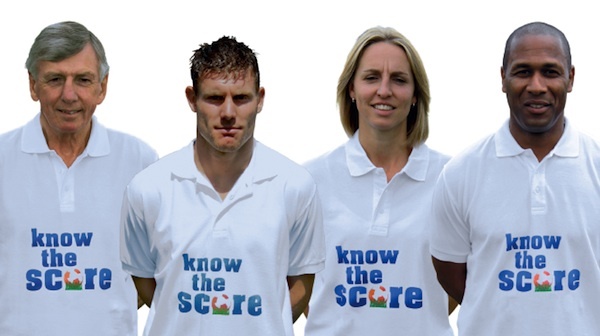 Built on a successful newspaper campaign, the Know The Score partnership features World Cup winner Martin Peters, Manchester City's James Milner, Faye White of Arsenal Ladies and former Spurs and Newcastle legend Les Ferdinand - all England internationals. Know The Score, founded by the Mr Brightside Project, brings together the Bobby Moore Fund, the Adam Stansfield Foundation, Beating Bowel Cancer, Bowel Cancer UK and the Men’s Health Forum. Look out for the launch of the new silver Bowel Cancer Star of Hope badge during the month. Chances are it won’t be cancer, but it’s better to play safe. Eating a healthy, balanced diet that’s high in fibre and low in red and processed meat. Taking these steps doesn’t mean you won’t develop cancer, but it helps to stack the odds in your favour.